In 2006, 37-year-old Sam Tyler (John Simm) is a Detective Chief Inspector with the Greater Manchester police force, investigating a spate of murders of young women. His frustration with the lack of progress in the case spills over into his personal life when he suspends his girlfriend and fellow officer Maya from the case, fearing their personal issues are interfering with their working relationship. Furious, Maya follows upon a new lead and goes missing. Fearing she has been kidnapped as well, a distraught and distracted Sam is hit by a car near a motorway overpass. When he wakes up the overpass has gone, his clothes and car have changed, his iPod (playing David Bowie's greatest hits) has been replaced by an eight-track and the year is apparently now 1973. An extremely confused Sam discovers he is now a Detective Inspector with the same police force, now serving under DCI Gene Hunt (Philip Glenister). He is unable to work out if he has gone mad, suffering a coma-induced delusion or has somehow really travelled back in time. As he tries to figure out what is going on, he discovers uncanny parallels between the case the team is following in 1973 and his own investigation in 2006 and realises he may be able to save Maya by changing history, but if all of this is in his mind, how can that be? 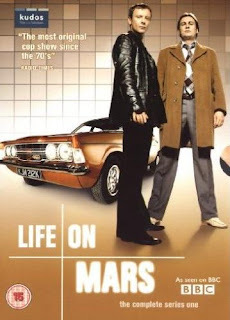 Life on Mars was a huge smash hit for the BBC when it aired as two seasons in 2006 and 2007. Its spin-off/sequel series, Ashes to Ashes, has maintained this success with that show's third and final season due to air next year. A US remake, which resets the action to New York City, was well-received earlier this year but low ratings saw it canned after half a season (although they got a - pretty ludicrous - explanation for their mystery in the final episode). This is 'high concept' TV, where the writers can sum up the idea in one sentence and the TV exec's immediate reaction is "We have to make this." The original thought was to make a straight 1970s cop show, but this ran into difficulties since any realistic show would not paint the police of the time - sometimes racist, misogynistic and hopelessly corrupt - in the best light. By having a modern, by-the-book, politically correct copper joining a 1970s team they created a very strong opportunity for drama and social commentary which, by and large, works well. "I think you've forgotten who you're talking to." "An overweight, over-the-hill, nicotine-stained borderline alcoholic homophobe with a superiority complex and an unhealthy obsession with male bonding." "You make that sound like a bad thing." The show is bolstered by its two leads, John Simm and Philip Glenister as the confused Sam Tyler and the magnificent Gene Hunt, an old-school dinosaur of a copper who believes that hunches and leaning on informants is a more reliable method of nailing crooks than forensic evidence and psychological profiling. These two actors first worked together in the mighty State of Play and are here reunited to stellar effect. Both actors - among Britain's best actors around at the moment - bring their A-game to this show. Glenister has a particularly tough job as Gene Hunt could become a figure of fun and caricature very easily, but he keeps the character rooted in reality. The writing is also fair, suggesting that whilst Hunt's methods for catching crooks are inept by modern standards, the lack of bureaucracy and paperwork does have benefits, with Hunt's methods sometimes working when Tyler's methodical plans fail to produce results. In fact, the episodes usually work best when Tyler and Hunt's different approaches work in tandem together. The supporting cast is also very strong. Liz White is superb as Annie, the only person in 1973 whom Sam confides his predicament in, whilst Dean Andrews as thuggish copper Ray is also great in a role that could have been very two-dimensional. He is very much Sam's enemy on the team, but Gene recognises his limitations (which fuels his vendetta towards Sam even more), which culminates in the penultimate (and best) episode of the season. Marshall Lancaster does a great job as Chris, a younger copper torn between Gene's old-school policing and what he sees as the more efficient and fairer ideas introduced by Sam, although he has arguably the least to do of the main cast in the first season. As the season continues, the episodes are generally divided between whatever the crime of the week is and what is going on in Sam's head (Sam suffers auditory and visual hallucinations which gradually convince him he is really in a coma in 2006) and how these impact on one another. This is a difficult balancing act to juggle, and sometimes you do wish they could just drop the weird stuff going on with Sam to just have a 'chalk and cheese' buddy cop show episode once in a while. At the same time, Sam's own internal journey is fascinating as the writers seem to confound the audience every time they think they know the rules. At least twice Sam seems to do something in 1973 which effects his present in 2006, and at one stage has what appears to be memories of one of his colleagues from his own POV as a four-year-old, which leaves the question of what is really going on very much up in the air. At this stage of the game things are left very ambiguous though. Some characters seem to know more about Sam's predicament than they are letting on, but others react to Sam's apparently insane outbursts in a more realistic and appropriate manner. What is going on? Well, we've still got a while to find out (the final episode of Ashes to Ashes promises to explain everything about both series), but the journey is a hell of a lot of fun, accompanied by a phenomenally good soundtrack. Life on Mars, Season 1 (****½) is part social commentary, part drama, part comedy and always extremely entertaining, excellently-acted and well-written. It is available now in the UK (DVD, Blu-Ray) and USA (DVD). that does sound fun. So the stuff that GRRM spoiled was only the American remake (god I do loath the concept of American remake so...)? Of all the possibilities for what's going on, the American remake went for the most retarded, the one UK fans spent about two minutes considering three years ago before going, "No, that would astronomically lame," and never thought about it again. Heh. Good news. So I can still watch Life of Mars, yay! Fortunately the first season has been aired in Germany last year. My wife and I really like it. And on last Sunday they started to air season 2! As usual German TV airs a synchronised version. Anyway I agree with your review. It s a good series.